Following on from our lovely walk round Elizabeth Quay, thoughts turned to lunch. As I said in last week’s post (see here), the quay is still a work in progress and apart from a couple of pop up kiosks there isn’t much in the way of refreshments there yet. Fortunately the adjacent Barrack Street Jetty has a few options – just keep walking towards the Bell Tower to get there. It was an unseasonally hot autumn day (well really late summer as early March is often still very hot here in Perth). 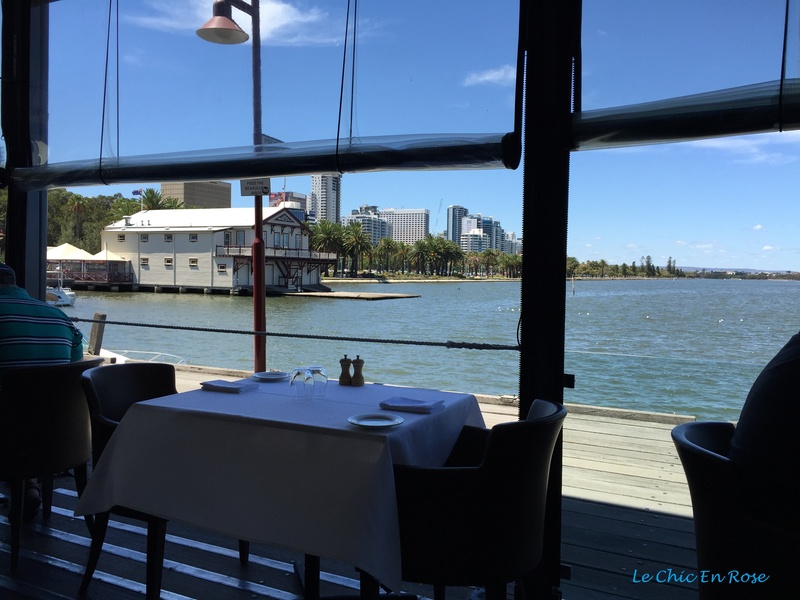 We were glad to get a seat on the veranda at Halo, a restaurant out on the jetty at the end of Barrack Street, which we’d visited once before many moons ago (under I think different management). Specialising (but not limited to fish and seafood) we had a superb lunch (see here for menu options). Using my upcoming birthday as our excuse we splurged on the 3 course fixed lunch – salmon ceviche, scallop carpaccio, pork cutlet with fennel slaw and good old fashioned fish and chips made up the starters and mains. I was thankful to fit in dessert at all but the trio of home-made ice creams was too good to resist and Monsieur Le Chic liked his selection of cheeses and accompaniments. Stylish and chic, Halo makes a lovely dining spot. However its best asset was definitely the superb setting out on the pier. The breeze down near the water was wonderfully refreshing and we had an enjoyable time watching the waves gently lapping on the water and the boats plying their way along the River Swan. 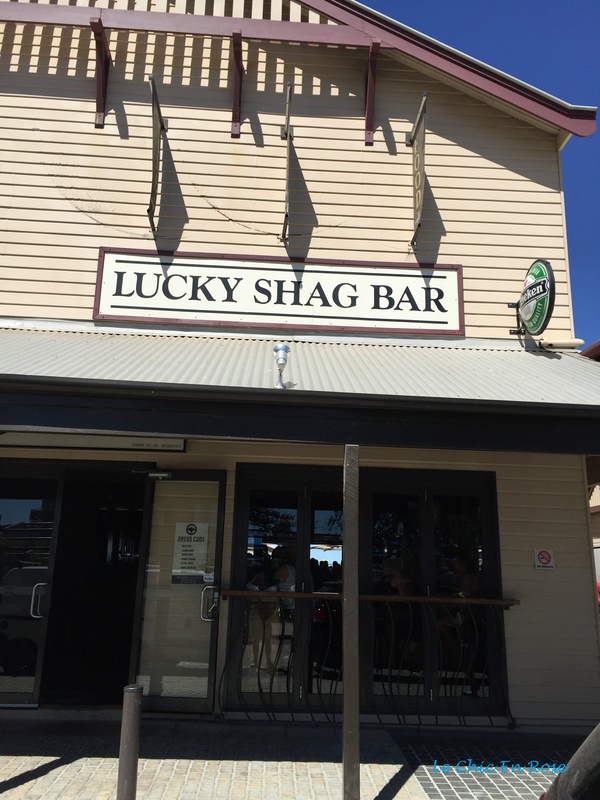 Next to Halo is the intriguingly named “Lucky Shag Bar” – for anyone interested this is the home from home of the English cricket fan squad, the Barmy Army. If you’re a cricket fan and ever in Perth during an Ashes series you now know where to go to find a drink! I’ll sign off with a lingering last look at the water views from Halo! Looks perfect to me Rosemary, you just can’t beat looking out over the water while you dine (I think). The food looks and sounds delicious as well, great choice for a birthday lunch! The weeks have a terribly bad habit of doing just that Rosemary, I can’t believe we are zooming towards Easter, Christmas was just 2 minutes ago!! Hope you enjoy the zoo – sounds like it will be a fun outing, fingers crossed you stay dry at least while you’re there!! I quite agree Joy – can’t believe it’s nearly Easter either! Of course it is early this year but even so…Yes hoping we won’t get too wet but today’s predicted storms went off inland so maybe tomorrow’s will do the same! It’s granddaughter 2’s first outing to the zoo so hope she will like it! We’re off for lunch at the Windsor Hotel afterwards so it will be a big day out for everyone! Am glad I can do these posts about Perth – it is lovely to be able to share stories and photos of my adopted home town! Food sounds gorgeous. The Lucky Shag sounds like a must-visit!! It’s well worth visiting – we’ve been there before it’s clever marketing but also a great location on the river!! Is there ever anything BUT a blue sky in Perth? Actually this morning is grey and stormy – thunderclouds are threatening!! We should be grateful for the rain…but we’re off to the zoo shortly with the family! Enjoy your day at the zoo. We had a lovely outing Jude thanks! Oh it is a lovely spot – how I wish I was there now sipping a cool glass of wine at Halo now! The Lucky Shag made me laugh! Hope you have a lovely weekend! Those plates of food look delicious!